This is the third installment of a four-part look-back on the Boston-Haifa Connection’s inaugural Hatikvah Mission, written by Ken Kaplan. In a downstairs hall of Temple Israel in Boston, students and teachers at the synagogue’s Monday Night School hurried to tidy up after dinner. It was time to move on to the next phase of the evening’s program. One by one, student leaders rose to address the room, filled with dozens of their peers. They spoke calmly, comfortably, authoritatively about items on the group’s agenda, including looming internal elections and the need for more people to participate in various programs. They exuded the knowledge, poise, and polish to make any educator proud. But as their teachers prepared them in the next room for an encounter with a team of Israeli officers, the need and challenge to bridge the gap between the communities became obvious. 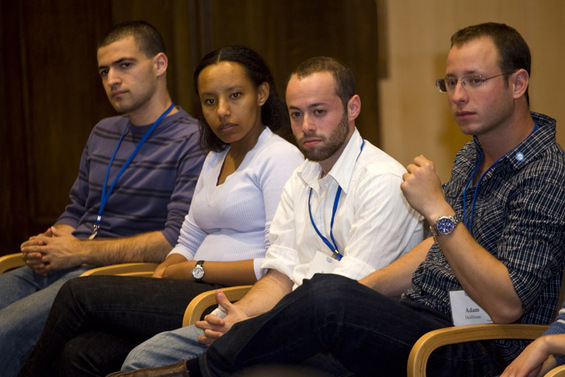 If the students knew of the significance of Yom HaShoah, Yom HaZikaron or Yom Ha’Atzma’ut, or had considered whether Israel does or should play a central role in modern Jewish existence, they did not let on. With little elaboration and amid an awkward silence, the officers introduced themselves by name and rank: Lieutenant Dror Katzav, 2nd Lieutenant; Aklile Kebede, medical officer; Eyal Chayet and Captain Adam Hoffman. For both sides, it seemed, this was going to be a meeting with the Other. Responding to the students’ first tentative questions, the officers recounted how they felt about military service before they were drafted and spoke of their sense of duty, the opportunities for service that they seized. Then a question, posed by a parent, went straight to a sensitive core issue: In light of the recent controversies surrounding Israel’s military missions, how do officers reconcile duty with conscience, orders with doubts? Secondly, he said, by way of illustration, “I took an active part in the evacuation of Jewish settlements in the Gaza Strip. I did that mission with tears in my eyes, and evacuated whole families from their houses. … And I can tell you as a soldier, as a warrior, in the IDF, we do our missions, and we believe in them from A to Z. With that compelling account, the barriers started to fall, the students were engaged, and when discussions resumed in smaller groups, the room hummed with activity. Moments later, as he recounted his experience as a soldier in the Second Lebanon War in 2006, it became abundantly clear how tightly bound Israelis’ lives are to dramatic events, past and present. Katzav noted that thanks to Israel’s small size, soldiers can often go home on weekend leave, even during a conflict. In 2006, he said, the war followed him home to Haifa, which was repeatedly attacked by rockets fired by Hezbollah. From group to group, the questions poured out. Family. Holidays. Religious observance. Hobbies. Sports. Shopping. At times, laughter erupted. Group pictures were taken. Stories were shared. Understanding increased. Bridges were built. Christina Broussard, a youth educator at Temple Israel who sat in on Dror Katzav’s conversation, said that the impact of that evening was still felt weeks later at a retreat the 8th-12th graders went on.